This remote control is bought directly from LG and is the exact same remote control supplied with your original LG product. Genuine LG Remote Control:? AN-MR18BA, AKB75375501 (ANMR18BA). Suitable for LG Models: OLED55B8STB, OLED55C8PTA, OLED55E8PTA, OLED65B8STB, OLED65C8PTA, OLED65E8PTA, OLED65W8PTA, OLED77C8PTA, OLED77W8PTA, OLED55B8STB-AAU, OLED55C8PTA-AAU, OLED55E8PTA-AAU, OLED65B8STB-AAU, OLED65C8PTA-AAU, OLED65E8PTA-AAU, OLED65W8PTA-AAU, OLED77C8PTA-AAU, OLED77W8PTA-AAU, OLED55B8STB-ANR, OLED55C8PTA-ANR, OLED55E8PTA-ANR, OLED65B8STB-ANR, OLED65C8PTA-ANR, OLED65E8PTA-ANR, OLED65W8PTA-ANR, OLED77C8PTA-ANR, OLED77W8PTA-ANR. Genuine LG Remote Control Type:? AN-MR18BA, AKB75375501 (ANMR18BA). Suitable for LG Models:?43UK6400PVC, 43UK6540PTD, 43UK6700PVD, 49SK8500PVA, 49UK6400PVC, 49UK7500PVA, 49UK7550PTA, 50UK6540PTD, 50UK6700PVD, 55SK8000PTA, 55SK8500PTA, 55SK8500PVA, 55UK6400PVC, 55UK6540PTD, 55UK6700PVD, 55UK7500PVA, 55UK7550PTA, 65SK8000PTA, 65SK8500PTA, 65SK8500PVA, 65SK9500PTA, 65SK9500PVA, 65UK6400PVC, 65UK6540PTD, 65UK6700PVD, 65UK7500PVA, 65UK7550PTA, 70UK6540PTA, 75SK8000PTA, 75UK6500PTB, 86UK6500PTB,?43UK6400PVC-AAU, 43UK6540PTD-AAU, 43UK6700PVD-AAU, 49SK8500PVA-AAU, 49UK6400PVC-AAU, 49UK7500PVA-AAU, 49UK7550PTA-AAU, 50UK6540PTD-AAU, 50UK6700PVD-AAU, 55SK8000PTA-AAU, 55SK8500PTA-AAU, 55SK8500PVA-AAU, 55UK6400PVC-AAU, 55UK6540PTD-AAU, 55UK6700PVD-AAU, 55UK7500PVA-AAU, 55UK7550PTA-AAU, 65SK8000PTA-AAU, 65SK8500PTA-AAU, 65SK8500PVA-AAU, 65SK9500PTA-AAU, 65SK9500PVA-AAU, 65UK6400PVC-AAU, 65UK6540PTD-AAU, 65UK6700PVD-AAU, 65UK7500PVA-AAU, 65UK7550PTA-AAU, 70UK6540PTA-AAU, 75SK8000PTA-AAU, 75UK6500PTB-AAU, 86UK6500PTB-AAU,?43UK6400PVC-ANR, 43UK6540PTD-ANR, 43UK6700PVD-ANR, 49SK8500PVA-ANR, 49UK6400PVC-ANR, 49UK7500PVA-ANR, 49UK7550PTA-ANR, 50UK6540PTD-ANR, 50UK6700PVD-ANR, 55SK8000PTA-ANR, 55SK8500PTA-ANR, 55SK8500PVA-ANR, 55UK6400PVC-ANR, 55UK6540PTD-ANR, 55UK6700PVD-ANR, 55UK7500PVA-ANR, 55UK7550PTA-ANR, 65SK8000PTA-ANR, 65SK8500PTA-ANR, 65SK8500PVA-ANR, 65SK9500PTA-ANR, 65SK9500PVA-ANR, 65UK6400PVC-ANR, 65UK6540PTD-ANR, 65UK6700PVD-ANR, 65UK7500PVA-ANR, 65UK7550PTA-ANR, 70UK6540PTA-ANR, 75SK8000PTA-ANR, 75UK6500PTB-ANR, 86UK6500PTB-ANR. 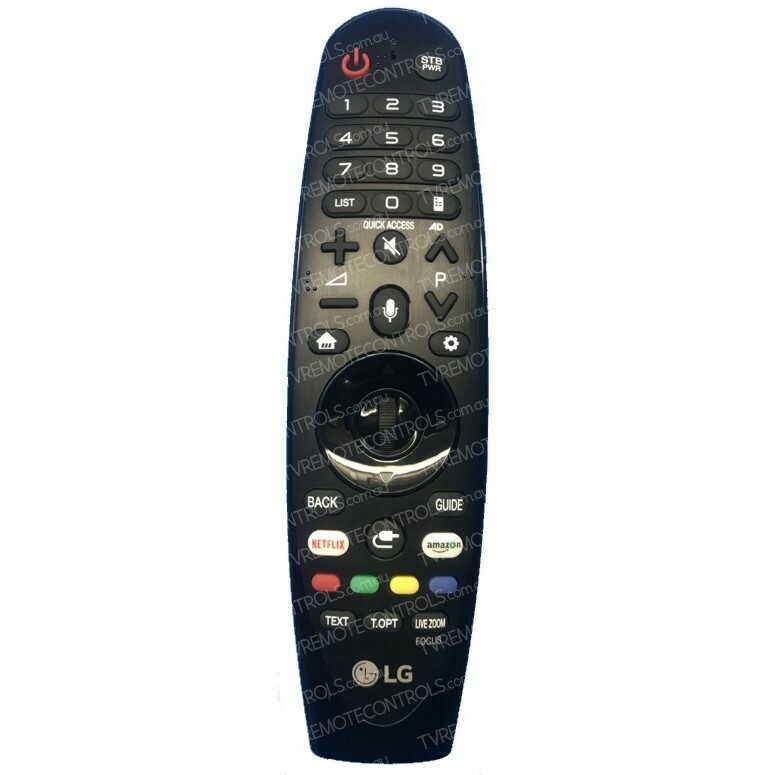 REPLACEMENT UNIVERSAL LG TV Control Remote suits all LG Television Models.